Puppies or Kittens – How To Better Match Arbitrators to Party Expectations? The Results Are In! Earlier this year, we published an article “Puppies or Kittens – How To Better Match Arbitrators to Party Expectations”, which we summarized here on Kluwer, calling for better-informed choices in appointing arbitrators. We highlighted that the lack of available information during the arbitrator selection process leads nominating parties to guess at potential arbitrators’ procedural preferences. Trying to bridge the information gap, parties often rely on two proxies: the arbitrators’ nationality and their legal background and qualification. Both may contain inaccurate assumptions that will disappoint the party later. Our “Puppies” article made the proposal that those things that arbitrators are comfortable discussing publicly should be broadly available. 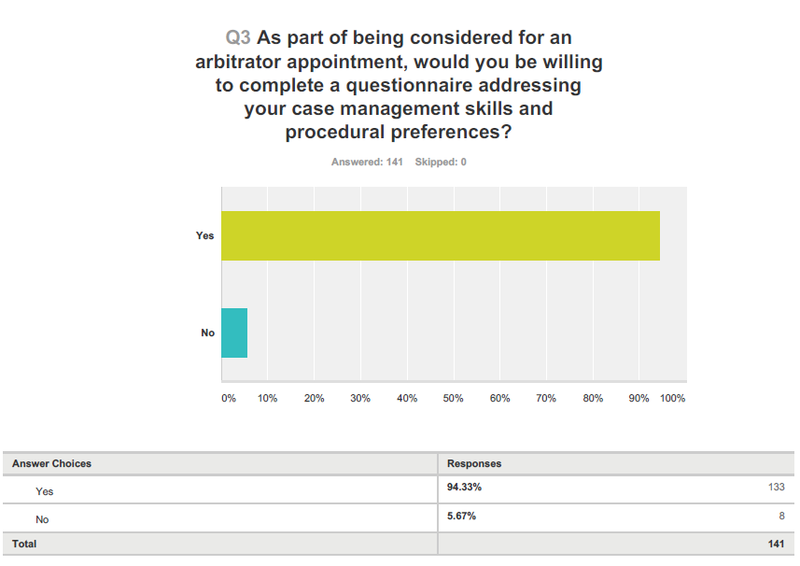 We suggested that arbitrators could help this by simply answering a questionnaire about their procedural preferences. We also anticipated that making this information more accessible would result in greater diversity of appointments, as it would increase the visibility of less experienced arbitrators. On April 28 this year, we posted a short survey on Kluwer Arbitration Blog asking the arbitration community for feedback on this idea. 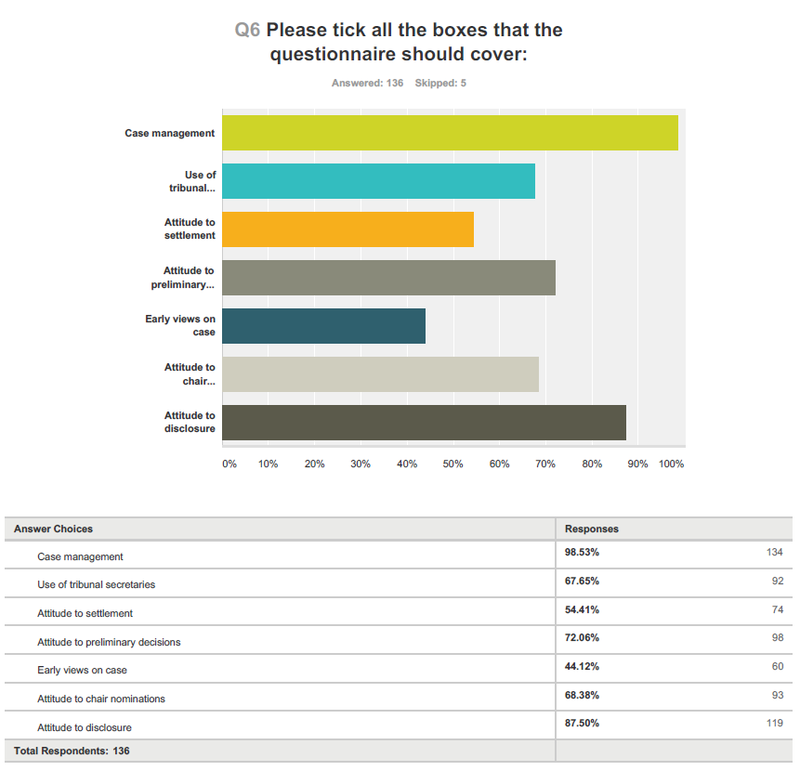 The survey was disseminated through Kluwer Arbitration, OGEMID and Arb-Med, was open for two months, and the responses collected were strictly anonymous. 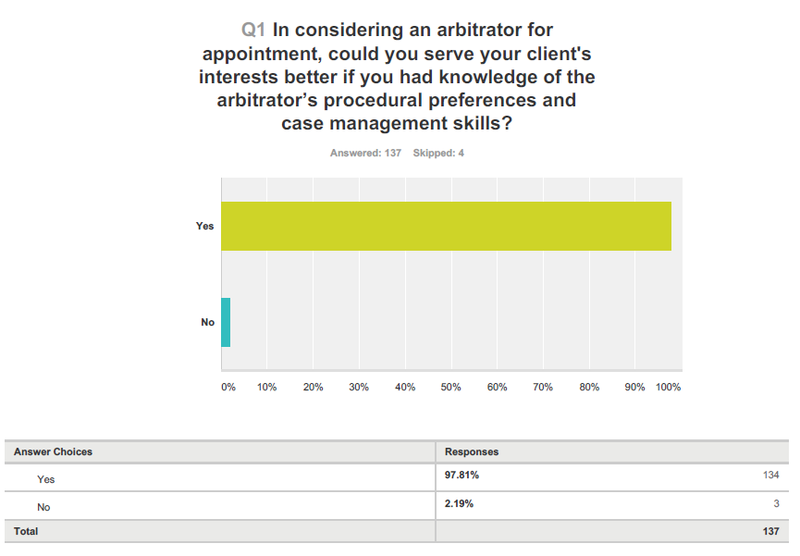 • 97.81% think they could serve the interests of their clients better if the procedural preferences and case management skills of the arbitrators were known to the parties in advance. 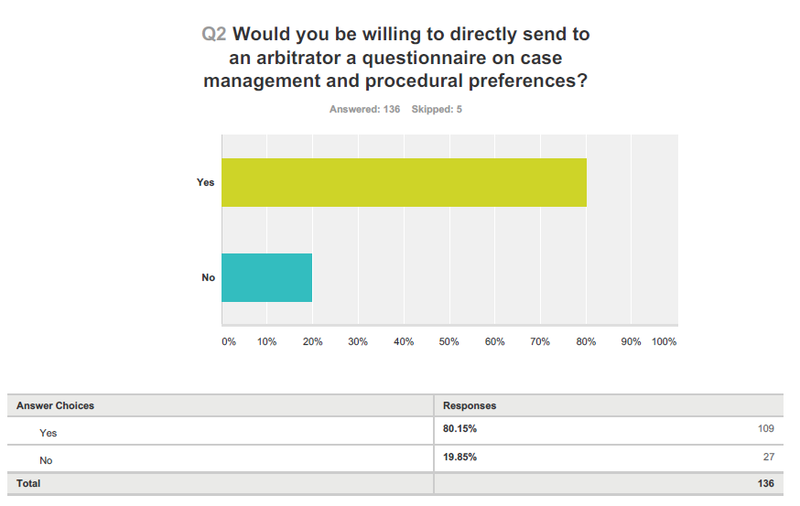 • 80.15% would be willing to send the questionnaire to the potential arbitrators. 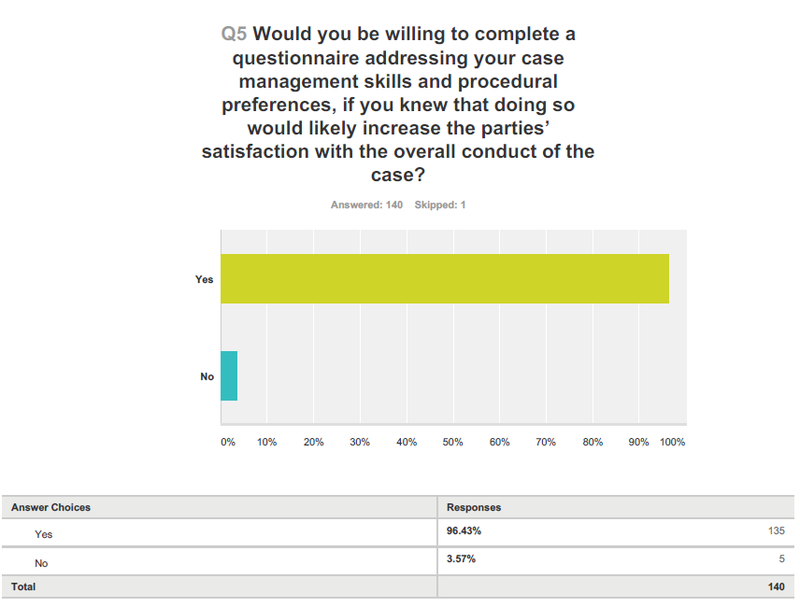 • 94.33% would be willing to complete a questionnaire as part of the process of being considered for an appointment. • 96.43% would be willing to complete a questionnaire if they knew doing so would boost their chances of getting an appointment. • 96.43% would be willing to complete a questionnaire if it would increase party satisfaction. Although the sample size was relatively small, the channels used to elicit responses were familiar to experienced arbitration practitioners. The ultimate goal of our proposed questionnaire was merely to suggest a step towards transparency that relies on what arbitrators themselves choose to disclose. We believe – and at least those answering our survey appear to agree – that this modest step would increase procedural predictability and party satisfaction. An obvious question is: what could be done with this? There are many possible applications. A Puppies-like questionnaire could be used as a tool of arbitral institutions that list pools of arbitrators, as an ancillary to online research tools (online databases) such as ArbitralWomen or Arbitrator Intelligence, or even as a means that arbitrators can use on their websites to present themselves to parties. 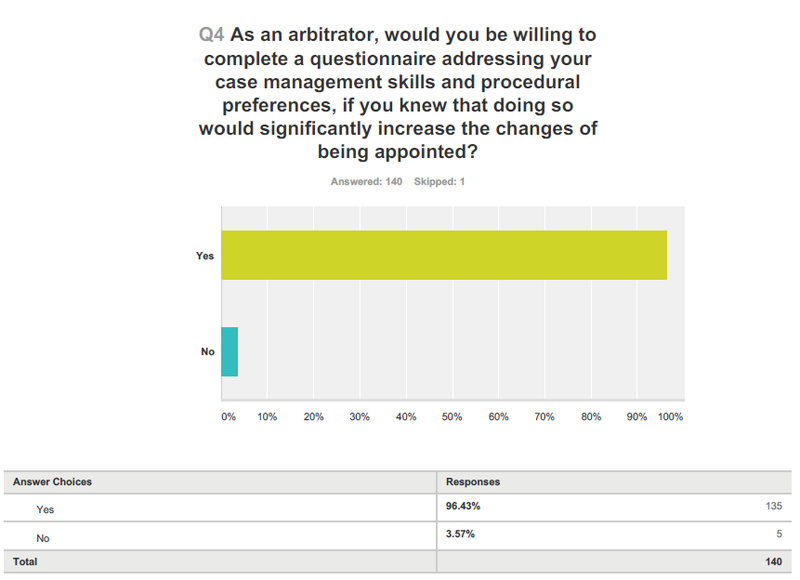 With respect to the last category, we invite readers to observe the completed questionnaire of an arbitrator based in the USA who included it on his website. Regardless of whether one agrees with “Puppies”, it is difficult to deny that the arbitrator’s answers and explanations present a different picture than one that would be yielded by relying solely on his biographic information or place of legal training.